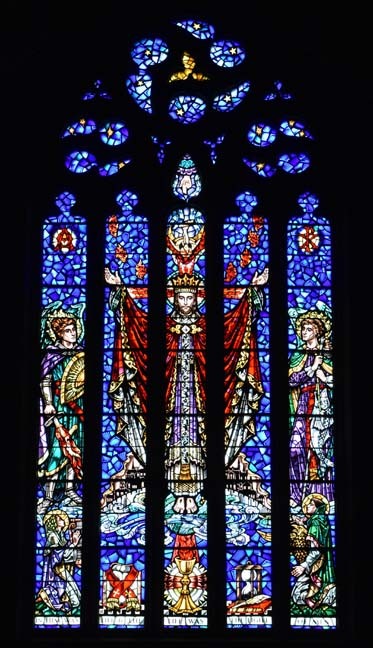 Brief Description of Subject: In her book "Discovering Stained Glass in Detroit," Nola Tutag commented that this "window with bold tracery above, is made entirely of hand-blown pot-metal glass from England, Germany, and France. The window, executed in mosaic style and with the decorative detachment of the Middle Ages, displays a rich background with a variety of colors shown in the garments of the saints, but all subordinated to the vivid red of Christ's robes". 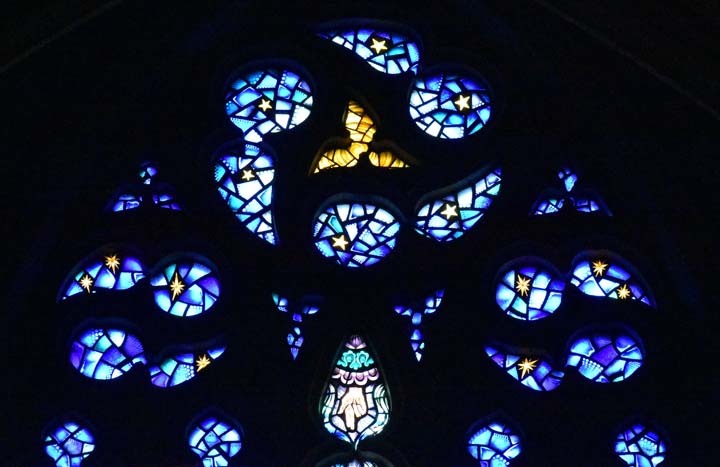 The canopy features islands of glass in blue shades, almost all containing at least one gold star. The pattern is best seen in the tracery viewed from the outside. To the right of Christ is the Archangel Raphael. He appears in the Old Testament "Book of Tobit." The ailing Tobit sends his son Tobias to collect a debt in a far away village. Tobias hires a guide for the trip. Unbeknownst to him the guide is Raphael. On the journey, they catch a fish and Raphael uses parts of the fish to preform miracles of healing. Raphael is the patron of healing as well as pilgrims. He is seen here with his attributes, a fish, and carrying a pilgrim's staff. Above Raphael's head are the capital Greek letters "Chi" and "Rho" --- the first two letters in the ancient Greek word for "Christ." At the bottom right is John the Evangelist, patron of this Church, kneeling and holding an eagle. By his knees are a quill pen atop a book and an hour glass. In Revelation 4:6 - 8, there are four winged creatures that surround the throne. These have come to symbolize the four Gospel writers; John's is the eagle. The quill pen and book are attributes of a writer of scriptures. The hourglass is a symbol of our mortality. In olden times it was not unusual for the deceased to be buried with an hourglass --- time ran out. The hourglass most likely refers to the inscription at the bottom of the window which is John 1:4 (KJV). In the inscription John is saying "Through Christ is eternal life." The window is in memory of John L. Edwards, long time organist and Musical Director and Irvin C. Johnson, rector from 1934 -1962. 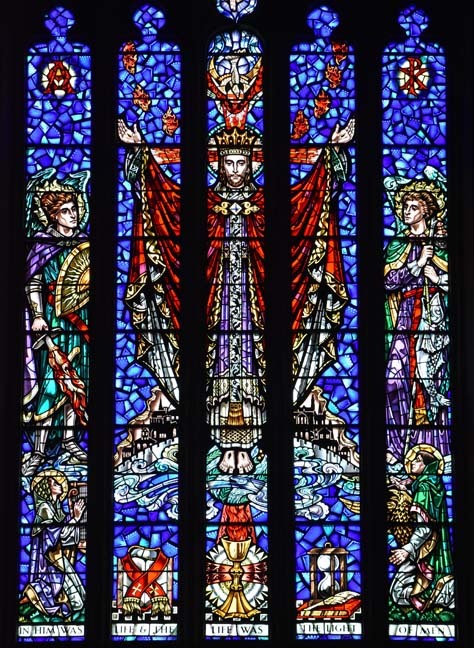 Although their names are not inscribed on the window, their professions can be seen at the bottom left --- patroness of Music, St. Cecelia with harp, and articles associated with an ordained priest, the "Book of Gospels" and a stole which is worn during the administering of sacraments.